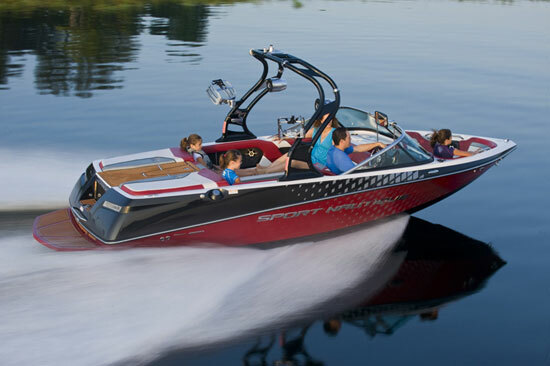 The new Nautique Super Air Nautique G25 is a watersports boat that makes no compromise. Nautique literature talks about the passion that goes into boats like it’s Super Air Nautique G21 and G23, and it’s certainly just as true with the new G25. 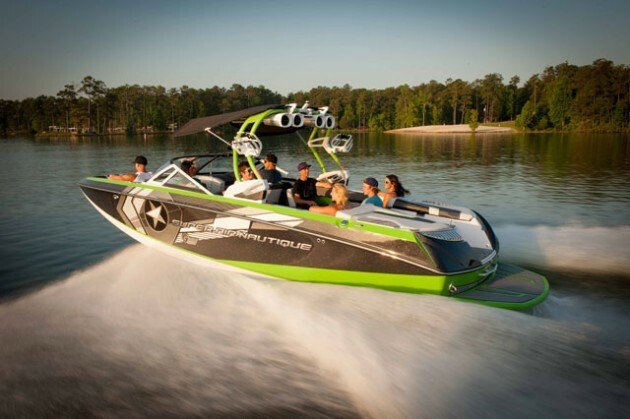 (Read Super Air Nautique G25: Wakes for the Entire Family, to find out more about the original G25 model). However, it takes more than passion to shop for and bring home a boat like this. 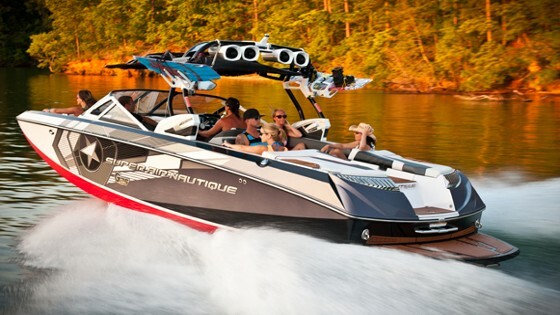 There's nothing second-rate about the Super Air Nautique G25. Nothing. Foremost, it takes commitment. The G25 is not a boat for the garden-variety weekend warrior who just wants to do a little wakeboarding. 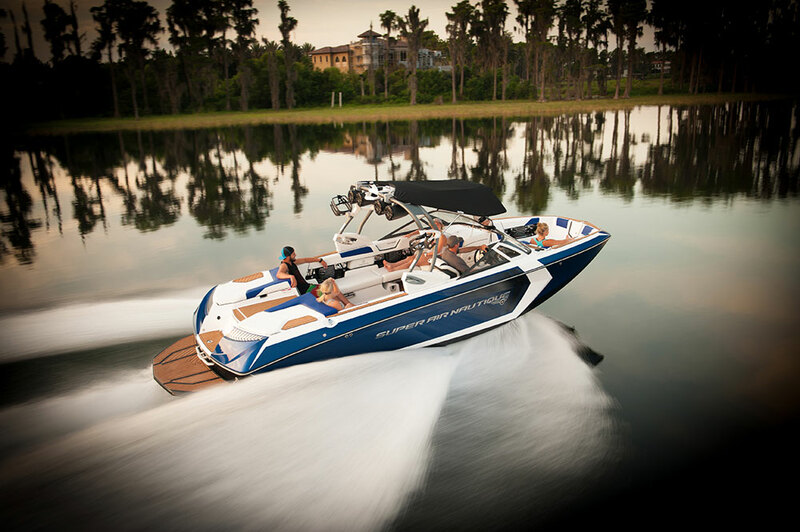 The G25 is Nautique’s vision of the ultimate boat for wakeboarding and wake surfing. Whether that’s true will be for the free market to determine, but we have no reason to doubt the company’s commitment to the marketplace in building such a machine. It also takes a commitment from the buyer. In many cases, buyers of a boat like this will be training a “Tiger,” by which we mean that it will be a boat used by aspiring professionals. Part of that is due to its equipment and the nature of the boat itself. Part of it is due to its price. Base MSRP is $135,429. Standard power is a 409-horsepower engine based on the GM LS architecture, which packs a lot of punch in a small footprint. For buyers who crave more power, there are options for a 450-hp naturally aspirated GM LS engine and a 550-hp supercharged version. For simplicity’s sake, we’d opt for the 450-horse version, which should be stout enough to push the 5,900-pound G25 around. 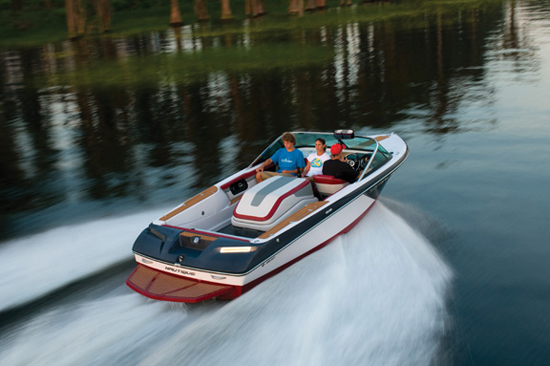 The largest boat in Nautique’s lineup, the G25 measures 27 feet, 3 inches long from bow to swim platform. Nautique claims this boat has room for 19 people, but that doesn’t sound like much fun. It would however, have a big effect on the size of the wakes this boat can turn out, especially when combined with the 2,850 pounds of maximum factory ballast. The huge ballast capacity is designed to work in conjunction with the Nautique Surf System with the Waveplate, which keeps the boat evenly weighted while allowing the driver to switch the wave from one side to another in seconds, with no need to shift people or ballast. Even with all that ballast on board, the G25 has plenty of stowage under all its seat cushions, which raise and support themselves on dual-action hinges. There are some other genuinely innovative features onboard, too, starting with the rear bench seat, which slides and flips forward to create a rear-facing bench in the middle of the cockpit. Even with the bench seat in place for watching the action behind the boat, you can still access the removable cooler beneath the sole. The lid is supported by a gas strut, and the cooler handles splay out so you can pull it out quickly and easily. I like the “pocket door” wind dam forward of the helm, which pulls out and locks into the port side dash beneath the windshield. The swiveling board racks and color matched speakers add a designer touch that complements the contrasting colors of the gelcoat scheme. Last, the built-in cooler and telescoping swim ladder on the swim platform contribute to the over-the-top equipment list for the G25. At the helm, the innovations continue. 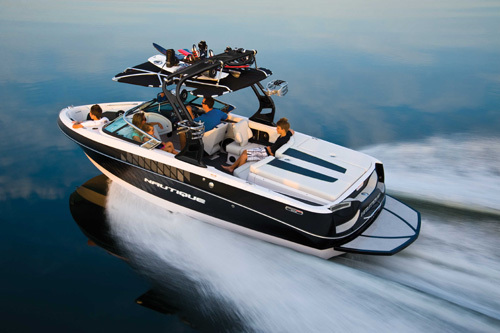 For example, Nautique was among the first tow boat builders to locate the touch screen control panel to the right of the steering wheel, so you don’t have to reach through the wheel to change the settings. That opened up a lot of dash space, so rather than let it go unused, Nautique included a nifty glove box to the left of the steering wheel. The throttle falls naturally to hand, but Nautique uses some dark colors on the armrest, which can scorch the underside of your forearm when exposed to sunlight. As should be clear by now, the Super Air Nautique G25 requires a high level of commitment — from the buyer and from the manufacturer. 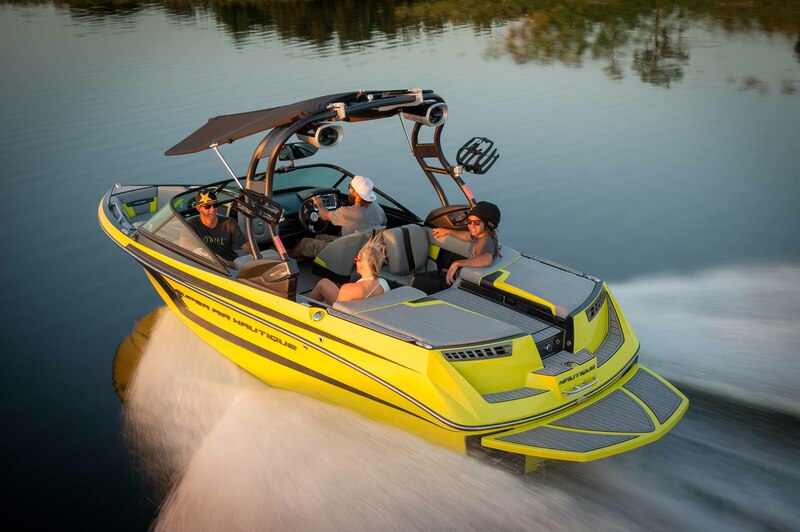 It shows that Nautique has gone all in on the wakeboarding and wake surfing boat market. The question remains whether there are enough buyers willing to exhibit the same commitment. 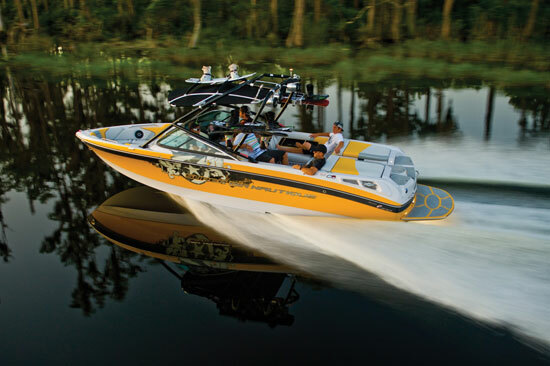 Other Choices: The MasterCraft X46 is another top-shelf dedicated wakeboarding and wake surfing boat. The Enzo 244 may be another of interest. 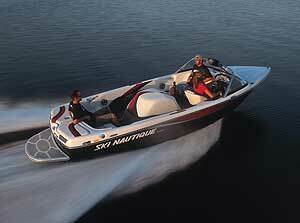 See Nautique Super Air Nautique G25 listings. For more information, visit Nautique.